If you are planning to use Green or White Asparagus, now is the time as they are fully in season . Even though my favourite is White Asparagus which we have been buying every week from the local market. And few days back when I was in the shops I saw green ones and they were really so cheap that I said I will take a bunch. 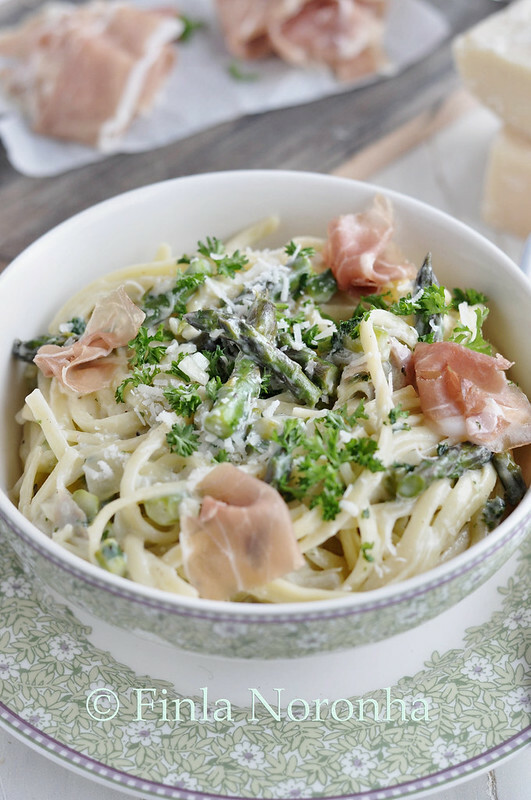 And next day for lunch I was like what am I going to prepare with these and I thought I usually make a pasta dish with peas and Ham and I thought why not use the green asparagus instead of peach, which I think give a much better taste to the whole dish. If you are a regular reader of my blog, you will know that I took a trip to Paris with two other food bloggers and Nisha from My Kitchen Antics had given me these beautiful bowl and plate and till now I have been waiting to use them for a dish and as the green Asparagus suits the color of the bowl and parsley is green too , I thought it is about time I used them. 60 gm freshly grated parmesan. 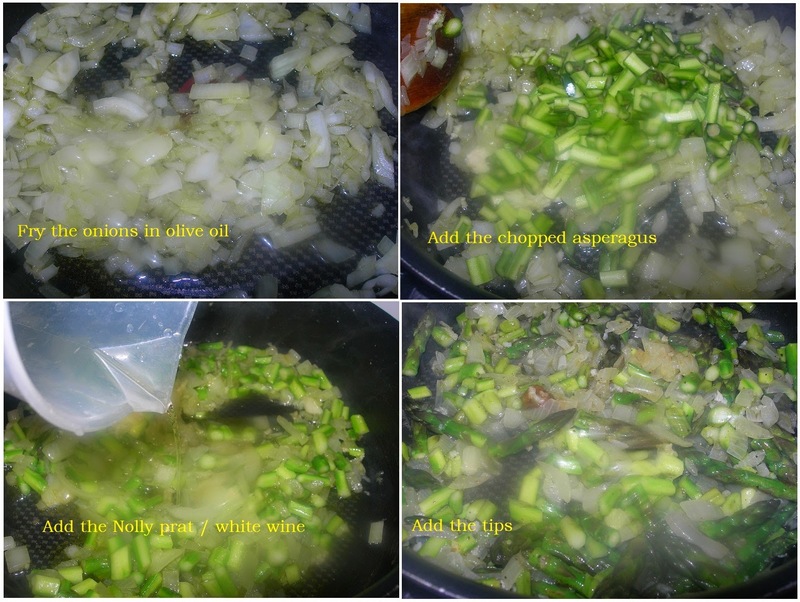 Heat in a pan the oil add the onions saute till they are soft, add the garlic fry for 1 minute and add the chopped asparagus , cook for 2 minutes add the Noilly Prat and cook for few minutes till most of it has evaporated, add the stock powder if you are using, . 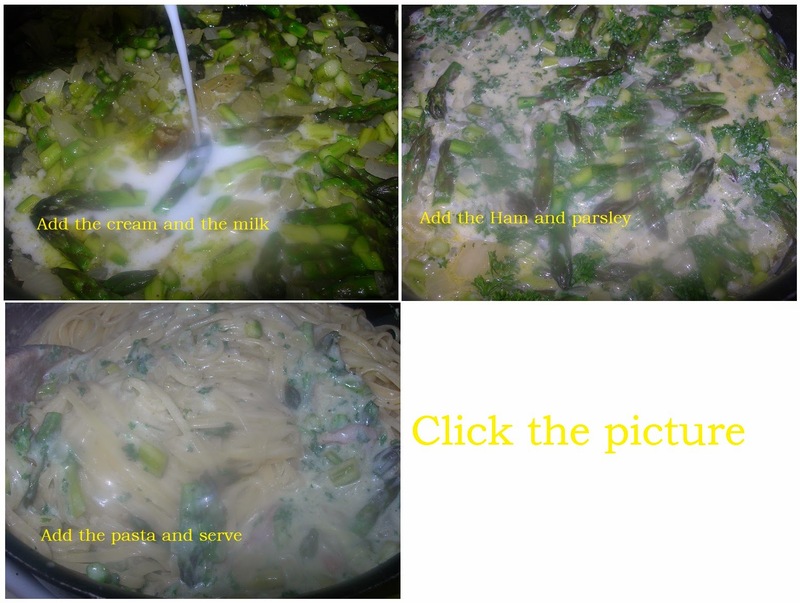 Cook till the asparagus tips are cooked but not too soft, add the tips, Ham ,parsley and cook for few minutes. 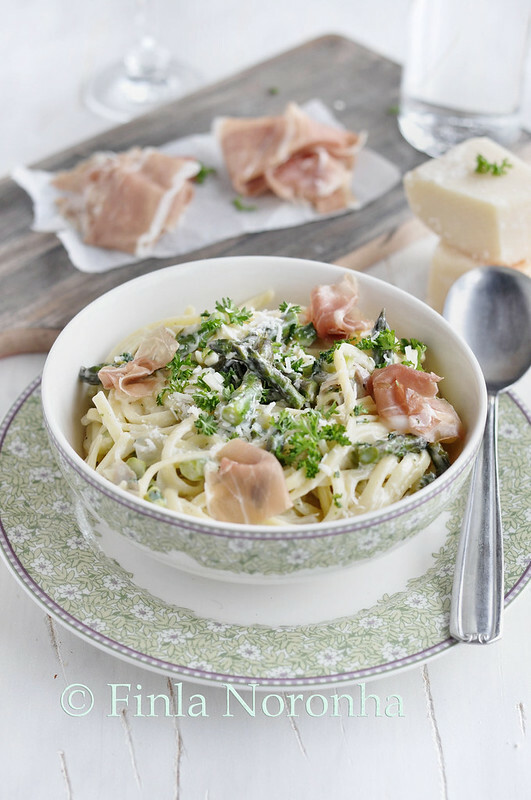 Add the cooked pasta and serve with a generous sprinkling of pasta. 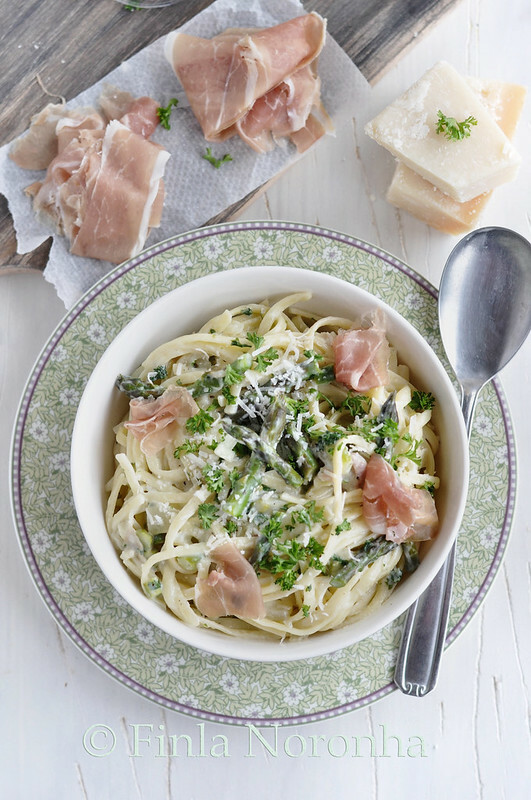 Italian ham and asparagus...I love this pasta dish. Beautiful! Only rarely do I see asparagus here, and then a bunch of five sticks is some Rs 200 so I can't bring myself to buy it. I've never even heard of white ones till now. My lil one was asking me to make pasta for his dinner Finla, wish i would have seen this earlier. Great pairing. I made something similar the other day and yes, with peas, so why not asparagus! I actually also like both together with some ham in a risotto. That's just gorgeous Finla! I love asparagus and my favorite is the green one. Possibly because there is no need to peel anything.. Lol.. Love that bowl!